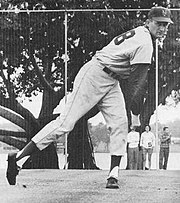 Roger Lee Craig (born February 17, 1930) is an American former pitcher, coach, and manager in Major League Baseball (MLB). During a 12-year playing career, Craig won 10 or more games in 1956, 1957, and 1962. A master of the split-finger fastball, Craig started his career with the Brooklyn Dodgers, and closed out his career with the Philadelphia Phillies. Craig was the starting pitcher for the Los Angeles Dodgers in Game One of the 1959 World Series, a series in which he also started Game Four. Craig was also the starting pitcher for one game apiece in the 1955 and 1956 World Series with the Brooklyn Dodgers, and he also pitched in relief in two World Series games for the St. Louis Cardinals in 1964, winning one game. Craig's overall World Series record was two wins and two losses, and his teams won three of the four series. Craig was perhaps best known after that as a player for being an original 1962 New York Met (actually, a 1962–63 Met), and for losing the first game in team history, 11–4 in St. Louis. (It has been erroneously believed that he gave up the first run in New York Mets history on a balk; although he did commit a balk in the first inning, he already trailed 1–0, and the balk was not a scoring play.) He was a stalwart of the legendarily bad team's pitching staff, finishing 10–24 and 5–22 games in those first two murderous seasons. (The Mets lost 120 games in 1962.) In 1963, Craig suffered through a personal 18-game losing streak as a pitcher. Remarkably, during those two seasons, he pitched 27 complete games, while winning a total of only 15, demonstrating that he was one of the best pitchers on the staff. During the 1962 and 1963 seasons, when Roger Craig lost 24 and 22 games respectively, the New York Mets played all of their home games at the antiquated Polo Grounds stadium, the former home of the New York Giants baseball team. His manager, Casey Stengel, told him, You've gotta be good to lose that many. At one point, Craig had dropped 18 in a row. But, he recalled, 11 of those times it took a shutout to beat me. From 1986 to 1992, Craig was the manager of the San Francisco Giants. In Craig's first five full seasons with the Giants 1986–90, they never finished with a losing record. Prior to coming to San Francisco, Craig served as a pitching coach for the 1984 World Champion Detroit Tigers and as manager of the San Diego Padres (the Tigers' opponent in the 1984 World Series) from 1978–79. 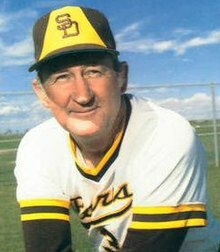 From 1969–1984, he had become one of the better-known pitching coaches in Major League Baseball, working for the Padres (1969–72; 1976–78), Houston Astros (1974–75) and Tigers (1980–84), with a knack for teaching the split-finger fastball to his charges. Under Craig (who along the way, instituted the unique motto and rallying cry "Humm Baby") the Giants won the National League Western Division title in 1987. The original term of "Humm Baby" was given to the roster's third catcher for the 1986 season, Brad Gulden, who was on his way out of baseball but he managed to squeeze onto the roster for the 1986 season. Craig felt that Gulden didn't really have the talent but he had the heart so he called him the "Humm Baby". The Giants' divisional title in 1987 came just two years after they lost 100 games; Roger Craig replaced Jim Davenport as manager for the final 18 games of the 1985 season (posting a 6–12 record). The Giants came within one game of going to the World Series that year, losing to the St. Louis Cardinals in seven games. In 1989 the Giants won their first National League pennant since 1962 by defeating the Chicago Cubs in five games in the NLCS. Craig's Giants were swept in four games by the Oakland Athletics in the World Series. Roger Craig stepped down from the San Francisco Giants in 1992 after posting a 72–90 record. His successor, Dusty Baker, won 103 games the following year and won the 1993 National League Manager of the Year Award. Craig finished with a managerial record of 738 wins and 737 losses. ^ "St. Louis Cardinals 11, New York Mets 4". retrosheet.org. Retrieved August 20, 2015. ^ Kroner, Steve (April 9, 2006). "20TH ANNIVERSARY: Brad Gulden / The original The original Humm-baby / Craig's fond label for scrub caught on". SFGate. Retrieved August 20, 2015. ^ a b "Roger Craig". Baseball Reference. Sports Reference LLC. Retrieved August 3, 2016. The original Humm-baby Article on the 20th Anniversary of the phrase "Humm Baby"